Here at Gentle and Caring Dentistry in the Eastern Suburb of Maroubra, Sydney we pride ourselves on offering a service that goes beyond dental treatments. Our commitment is to build a healthy dentist-to-patient relationship with our patients so that we can not only treat the dental concern but treat the underlying issue that may be causing the problem. Have you or someone you know ever had a dental emergency and struggled to find a dentist available in a hurry? Here at Gentle and Caring Dentistry we provide emergency dentistry services so you can have your dental concern treated as soon as possible. It’s no secret that sometimes accidents happen but it’s important to take into account situations where tooth loss has occurred, time is of the essence! There are a host of different accidents that can be categorised as a dental emergency. Generally we encourage patients to contact us if you are suffering from tooth loss, cracked teeth, bleeding gums, loose adult teeth, consistent discomfort and/or chronic pain. With a range of cosmetic dental treatments available, our team at Gentle and Caring Dentistry are committed to offering only the latest and greatest treatment options for our patients to keep them smiling. What cosmetic dental treatment would you be interested in? Thanks to advances in dental technology combined with approved training and expertise, our team at Gentle and Caring Dentistry concentrate on assisting all our patients by designing dental treatment plans that zone in on the patients’ needs and desires specifically. The smile is made up of many different components including the teeth, gums, tongue, jaws and lips – all of which depend upon each other to remain healthy. By booking in for regular check-ups every six months, we can ensure the health of your smile is in check and keep track of any developing concerns that could affect the future of your smile. Preventing tooth loss and decay is a much better alternative to having to replace and repair teeth. During your general check-ups we work with you to ensure your smile is healthy and beautiful. The key to a life-long smile is to take care of your oral health. Want an excuse to brush twice and floss daily? Preventive dentistry focuses on providing treatments and education that count the effects of poor oral health before they become a problem. How can preventive dentistry help you? By providing a relaxing atmosphere, we strive to make your experience with us as caring, easy and efficient as possible. Restorative dental treatments aim at repairing or replacing (if absolutely necessary) chipped, cracked, broken or missing teeth. Prior to commencing your treatment we will sit down with you and discuss your options so you are fully aware of what treatments could be appropriate to resolve your concern. What are the different restorative treatments available? Here at Gentle and Caring Dentistry we use up-to-date treatment techniques and materials to help achieve long-term success for our patients. By investing in restorative dentistry, you are investing in a smile that will last. With advanced technology, enhanced techniques and a gentle touch, we believe your dental care should cause minimal pain or discomfort. What different methods of pain relief do we offer? For more information on pain relief and sedation, or information regarding our treatments, feel free to browse our website today. 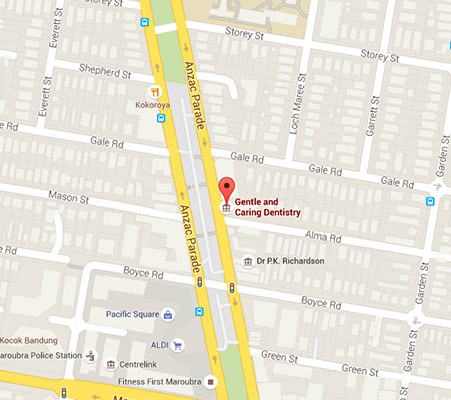 Located in the Sydney Eastern Suburb of Maroubra, our team at Gentle and Caring Dentistry work hard to ensure our patients are treated with the upmost care when it comes to their dental visits. Book a consultation with our team today and find out how we can help to keep you smiling for a lifetime.